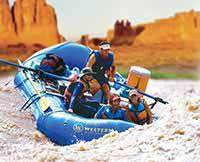 As I anticipated my rafting adventure on the Colorado River, I was scared to death of running the whitewater rapids and for my son to do them, too. He is a daredevil and that was the reason he wanted to go the most. The trust that I was able to invest in our Western River guides in the first few days turned that around for me. 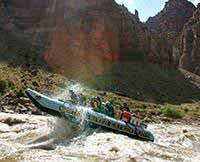 I had complete faith in them by day 3, so I rode the front of the boat, a lot for the rapids. If I lost a hand hold, one of the guides was there immediately. I feel so proud of myself for taking on this new challenge. And I thank them for their encouragement and guidance and how they prepared us. I really liked knowing how they were thinking about maneovering the rapids (the time we stopped after the first big drop and they examined the wave patterns for example). I always like to know what the game plan is and Stephen, as tour leader, laid out very clearly what we would be doing at every stage. Everyone at the office was helpful during the reservation process. I loved the time we had to listen to our bodies and challenge them, to do beautiful hikes at all times of the day and encounter exquisite scenery. The meals were amazing and I loved the fanfare that always accompanied the unveiling of dessert each night. I loved learning about the geology (and I loved the jokes and the fact that the guides never took themselves too seriously). The team spirit we developed with the other guests was incomparable. We did not want to say goodbye and are planning a reunion trip. One of my new buddies dubbed me "Professor River Rat" (I was the lone academic on the trip which was so refreshing both for myself and my son; we are used to hanging out with university types). My son is a river rat in training, river guide wannabee for sure. This was the sweetest, most indulgent, slightly naughty and most irreverent group of guides; we all commented to each other on how awesome they are. You are truly lucky to have Stephen as your tour leader, his bromance Danny, along with Jace and Lane. They were the most effective team and it was clear that they valued each other's skills and friendship, both on the boat and off. 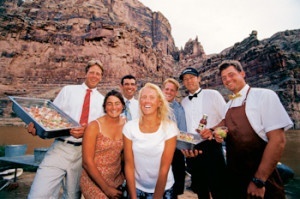 Some of us decided, in order to encourage single men and women to join you, that you do a river guide calendar. Originally I thought Stephen should be Mr. January but I think you should save the best for last and make him Mr. December. My new soul sister Terryl would argue with me about that, since she loved Jace, but I beg to differ. I have been talking up this experience to anyone who will listen since my return. I have come away from this experience much more bonded with my son, and he has learned a lot about himself and his strengths. I have renewed confidence in what I can do, and this trip came at an opportune time, helping me renew my free spirit and offering my son a real breather after a pretty tough spring for both of us emotionally. We have made so many new friends and have invitations for visits all over the country as a result. Make sure you have gloves if you are planning to ride up front on the j-rig boats. Keep a hoodie and a rain jacket on the boat, make sure to buy your beer/wine etc. before you get to Utah, or stop by the Caste Creek Winery at Red Cliffs Lodge on your way into town and do their wine-tasting and pick up their Cab. It's awesome. Lots of water, lots of sunscreen, and plan to be creative about your bathing options in the evenings! These are the best guides we could have hoped for. My son is 16 and they were such great role models for him. He is a river guide in training.